6 min read . Updated: 19 Nov 2007, 11:48 PM IST John Samuel Raja D.
Tirupur, Tamil Nadu: In parts of Tamil Nadu, Tirupur is called dollar town. Poor workers in other parts of the state, and some outside it, assume that the town’s standing as India’s most important hub for textile exports means better jobs, better pay and a better life. But there is another side to the town that earned Rs11,000 crore last year from apparel, the bulk of it from exports (up from Rs740 crore in 1993-94). With 88 slums, and one-third of its population of 352,000 living in these, according to a two-year-old study by the Tamil Nadu government, the latest available, Tirupur is a shanty town. Workers’ representatives and non-governmental organizations blame exporters for getting away with paying low wages. The exporters say they do not violate any labour laws and claim that in an era of increased scrutiny from international buyers keen to ensure their products are made the “right" way, it is difficult for them to get away with a low-wage structure and poor working conditions. They add that they can’t do this (pay low wages) any way because there is a shortage of workers. “No one can risk such a thing as one wrong audit can lead to cancellation of orders," says R. Sivaram, executive director of Royal Classic Mills Pvt. Ltd. “My company can become bankrupt overnight if I am found violating any laws". Still, 60% of families living in the slums work in the textile (or specifically the hosiery) units that have put Tirupur on the world’s textile exports map. The population in slums is growing, says M. Chandran, district secretary of the Centre of Indian Trade Union (Citu), affiliated to the Communist Party of India (Marxist). He adds that the main reason for this is widespread violation of wage agreements by exporters. “When there is acute scarcity of workers, there is no chance of paying under the agreed contract or exploiting (workers)," he says. Chandran says it is only small units that do not follow the wage agreement and flout labour laws. 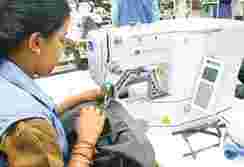 According to a wage agreement signed in December 2006 between trade unions and the Tirupur Exporters Association, an industry body representing exporters here, daily wages range from Rs80 to Rs156.07. This agreement is valid till December 2010. The real reason why Tirupur is a town of slums may have to do more with migration than low wages paid by exporters. The town started becoming a hub for textile manufacturing in India in the late 1970s when manufacturers from West Bengal and Maharashtra shifted base here. Labour, from neighbouring areas in Tamil Nadu largely, was plentiful and, more importantly, not unionized—a significant factor for units relocating from Maharashtra and West Bengal, both states where the unions have traditionally been very active. The water in Tirupur, too, was of better quality—although that has changed over the years and the town faces problems related to both the quantity and quality now—and able to bleach clothes better. Much of the initial output was sold locally; exports started as a trickle in the 1980s; and grew into a flood in the 1990s. Even today, Tirupur thrives on migrant labour. And that’s one reason why some exporters can get away with paying low wages, says Chandran. Labourers from surrounding areas in Tamil Nadu account for more than 60% of the workers in Tirupur, according to some of the workers and exporters, and they are happy to work for less because what they earn is still much more than what they would back home. Many of these workers, Chandran says, want to work for between six months and a year, and then return to their villages. Thus, they do not join the trade unions. At last count, there were six major unions in Tirupur, most affiliated to one political party or the other, with Citu being the largest and the ­strongest. Some union representatives estimate that less than 10% of the 700,000 workers employed by the towns 3,500 textile units belong to a union. The number of workers exceeds the population of the town as measured by the government because the last survey was done two years ago and such surveys usually leave out short-term migrants. The wage agreement between exporters and unions say that both unionized and non-unionized workers need to be paid the same. But this is rarely done, says Chandran of Citu. “Migrant workers do not protest even though they are not being paid as per the wage agreement as they compare the salaries they get in Tirupur with what they got in their native places," he says, adding migrant workers were also not interested in joining unions. Over the past years, say union members, the number of workers who are part of a union has consistently declined —migrants and women workers are the beneficiaries, says A. Aloysius, director of Social Awareness and Voluntary Education (SAVE), a non-governmental body working in the Tirupur region. And like migrants, women usually do not want to be part of a union. Most exporters have a good cause to try and pay lower wages even if they are not doing so. According to a report by credit rating firm Icra Ltd, a 10% increase in wage cost results in a one percentage point decline in operating profit margin. This year, the rupee has appreciated by 11% against the dollar (till the end of October). That’s affected the profit margins of exporters based in Tirupur, even though their primary market is Europe, not the US. Textile exports from India touched $17 billion (Rs73,848 crore then) in the year ended March, out of which apparel exports were $8.4 billion. Net profit margins in apparel exports range between 5% and 8%, according to the Apparel Export Promotion Council, a government body. It is an eye on costs that keeps most workers in slums. Rents elsewhere in Tirupur are high. R. Kannan, from Tamil Nadu’s Virudunagar district says that if he lives in a proper house in a well-planned area, he “will be left with nothing" after he pays the rent. Kannan pays a rent for Rs600 for the room he shares with two others. The room is barely functional, and he has to walk a minimum of 45 minutes to a bathroom. Kannan estimates his monthly expenditure at Rs3,000 a month. According to a study by SAVE, done four years ago, a family of four in Tirupur needs Rs6,500 a month to keep body and soul together. Exporters and workers say that one reason for Tirupur’s shanty town topography is the government’s inaction. “No initiative is taken by the government for the workers. 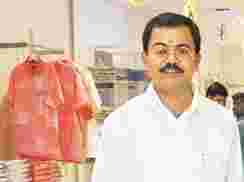 It is only now Tirupur will be granted corporation status," says Chandran. In October, the Tirupur Municipality announced a Rs21 crore plan to develop the slums as part of the Integrated Housing and Slum Development Programme. “The amount is small compared to the magnitude of the problem. We hope to have better allocation in the next budget," says C. Govindasamy, a CPI(M) legislator, who represents Tirupur in the Tamil Nadu assembly. Chandran wants the government to build houses on its land and rent them out two workers—for profit. “There is no need for subsidy," he says. Dollar town’s residents can pay rent—they just can’t pay too much of it.